This is the only web site fully sanctioned by the Ford family. BOOK UPDATE May 1, 2013 in "PUBLICITY UPDATES SECTION"
Peter and Lynda have sold their home (formerly Glenn Ford's home) in Beverly Hills and are moving to Burbank, California effective July 1st. Peter's book will continue to be available through his web site and Amazon.com. The University of Wisconsin Press has made an arrangement with Audible.com for the release of Glenn Ford: A Life for the release of an audio version of the book. It will be available later this year. Beginning on October 8th Peter and Lynda will be in Barcelona (Spain), Venice and Rome (Italy) for an extended stay. We will return home at the end of November. TO PURCHASE A DISCOUNTED COPY OF GLENN FORD: A LIFE FROM AMAZON.COM, PLEASE CLICK THE "PURCHASE THE BOOK" LINK IN THE INDEX ABOVE. TO RECEIVE A PERSONALLY INSCRIBED SOFT COVER OF THE BOOK, IF YOUR DELIVERY ADDRESS IS IN THE UNITED STATES, YOU MAY DO SO DIRECTLY FROM THE AUTHOR BY SENDING $30.00 BY CHECK OR MONEY ORDER. Peter Ford, 1169 East Providencia Avenue, Burbank, CA. 91501-1627. Make sure to include to whom the book should be inscribed and the address to which the book should be mailed. Your order will be filled promptly with insured media mail shipping - 5 - 7 days - within the United States. This special $30 offer is only for residents of the United States. For deliveries to Canada ($45.00), Australia, Europe, South America, and Asia ($55.00). Pay Pal is available for an additional $2.00 per book. Any questions should be sent through the "Contact the Author" link on this website. Promo video made by Charmed Productions about the new biography, Glenn Ford: A Life written by his only child, Peter Ford. Whether galloping across the plains with the grace and control of a true cowboy, slapping around a hardboiled dame in a film noir thriller, or charming his way through a romantic comedy, Glenn Ford embodied an indelible array of screen heroes. Now, fans of the handsome actor known for such classic films as The Blackboard Jungle, Gilda, Jubal, The Big Heat, The Teahouse of the August Moon, and Superman, to name only a few, will soon have reason to celebrate. 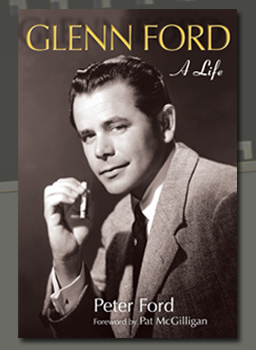 Peter Ford, the star’s only child, is writing a biography: Glenn Ford: A Life. Brimming with behind-the-scenes tales of Glenn's sixty-year acting career, the book will feature exclusive interviews with dozens of his esteemed costars, including Ernest Borgnine, Sidney Poitier, Evelyn Keyes, Debbie Reynolds, Shirley Jones, James Whitmore, Carl Reiner, and Angela Lansbury. Directors such as Vincent Sherman, Delbert Mann and Richard Donner will offer insight into Ford’s naturalistic, yet dynamic acting style, and his refinement of a screen persona that has been embraced by moviegoers the world over. Moreover, Glenn’s personal life will be examined with the insight and authority that comes only with exclusive access to family members, longtime friends, and a vast collection of diaries, letters, and unpublished interviews. Perhaps most important, Glenn Ford: A Life benefits from the stars own voice. He will recall everything from his early career struggles to his prodigious love life, including his publicized affairs with Rita Hayworth, Judy Garland, Hope Lange, and Connie Stevens, and lesser-known romances with the likes of Joan Crawford and Maria Schell. His famous sixteen-year marriage to dance icon Eleanor Powell (Peter Ford’s mother), is discussed in candid detail. Much admired for his outspoken patriotism, Glenn also reflects on his decades of proud service in the Coast Guard, the Marines, and the Navy Reserves. Glenn Ford: A Life will offer a unique portrait of one of the most stellar and versatile leading men in the Hollywood pantheon. © Copyright Peter Ford, 2004-2013 - The entire content of the glennfordbio.com website is the original and copyrighted work of Peter Ford unless otherwise attributed. No portion of these pages may be reproduced in any form without the expressed written consent of Peter Ford.